This year’s annual Renegade pro-am bass tournament was held once again on Mississippi Lake in Carlton Place, Ontario, and it was my good fortune to be invited back to fish with one of their amazing professionals. 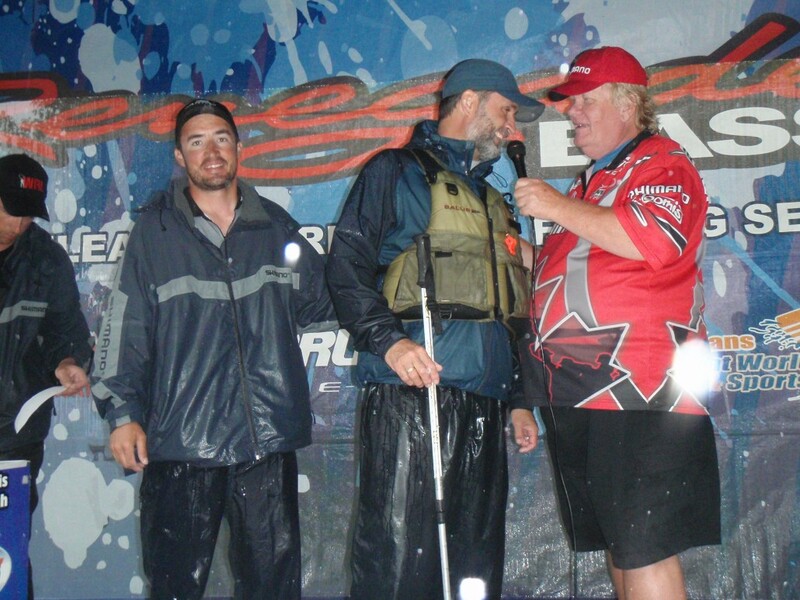 My guest Renegade pro aboard the Ranger 620 was Corey Gaffney, one half of the famed Gaffney brother team that dominated routinely throughout the Renegade tournament series up until Spencer Gaffney’s career progression within the fishing industry transported him to southern Ontario bringing to an end this dynamic dual, for now. Corey Gaffney started his professional fishing career at the age of 19, and over the next nine seasons he’s proven that he’s more than capable of competing in Ontario’s premier bass series. 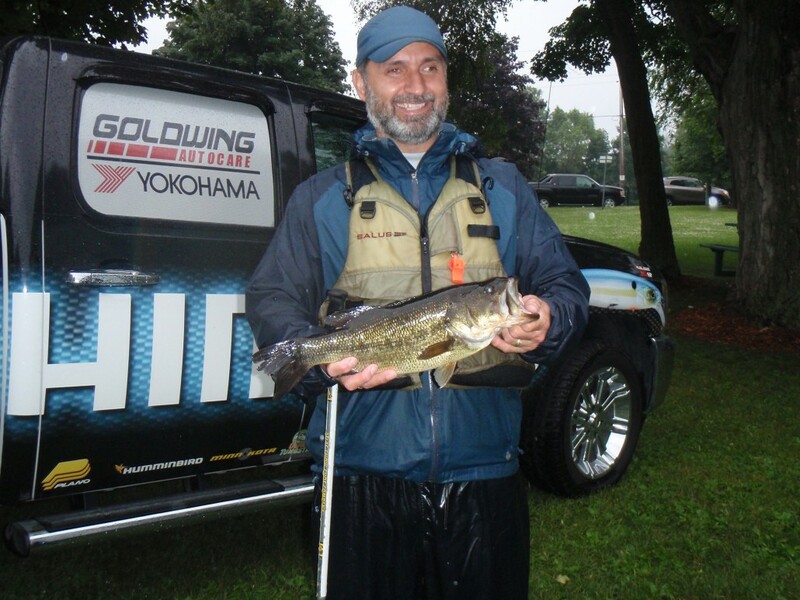 A competitive hockey enthusiast, Corey grew up fishing Mississippi Lake, which contributed to his second place finish the day prior to the pro-am. Corey and his new partner Trever brought in a bag of five Bass weighing over 18 lbs – three of the Bass tipping the scales at just over 4.5 lb each. Corey’s Mississippi Lake game plan for our own pro-am competition was to focus on Smallmouth Bass first, and then go looking for a kicker Largemouth to put us over the top. Weather conditions had changed dramatically throughout the night. Instead of bright sun, we were facing a day of dark clouds, high winds and heavy rain which, you guessed it, was exactly what we experienced up until one hour after the weigh-in concluded. Even though my Ranger is equipped with driver and bow mounted Lowrance sonar systems, I discovered later that morning that Corey hadn’t bothered to turn either of the HD units on. Upon my pointing out this slight oversight, Corey said he knew the lake more than well enough to run “blind”, although he did regret not having access to his waypoints. In the end, he didn’t seem to experience any difficulty finding our targets. Our largest Bass of the day, a 3.5 Largemouth, came on a white / chartreuse double-willow Jackle spinner bait. Hard baits and toads also performed well. With the fish on the move we had little choice but to stick to search baits. After watching me retrieve my toad, Corey recommended I keep it on the surface where Bass had less opportunity to observe that my bait was an imitation. I pointed out that I had caught Bass in the past fishing toads sub-surface, but Corey felt larger more experienced fish would be less likely to strike a sub-surface toad as they would have more opportunity to reject the bait. He also suggested I could eliminate having to reel quickly to raise the toad to the surface after each cast by stopping the cast just prior to splash-down so that the retrieve could commence instantly. It worked. On my very next cast I caught a decent keeper. Corey truly has the competitive spirit. I don’t think he stopped fishing once the entire seven hours we were on the boat other than to pilot the Ranger. His work ethic paid off. With ten minutes to go, not only did I catch another Bass that culled, on his last pitch for the day Corey produced our second largest Bass of the day. Not quite the kicker we were looking for, but enough to assure our finishing well into the top half of the field. Weights of the 25 competitive pro-am teams ranged from 8 lbs all the way up to 16. However, only two fish were caught over 4 lbs, and the vast majority of the bags were between 11 and 13 lbs. everyone caught plenty of fish which meant a lot of smiling faces. A Shimano spinning outfit, $50 gift certificate from a local fishing tackle store called Paddle Tales, a bag full of goodies from Berkley, and a complimentary BBQ all helped broaden those smiles even further. 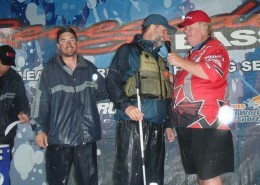 Lowrance Elite sonar systems for the top three amateurs rounded off the prize package. 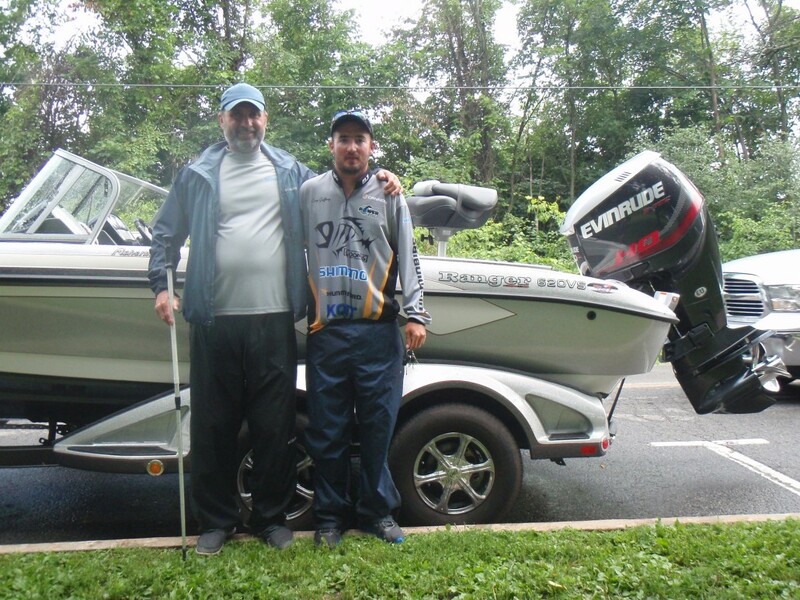 The Renegade pros donated their boats, time and gas, and can take pride in the fact that they introduced 25 new potential tournament fishers to the competitive sport of Bass fishing. Big thanks to Corey Gaffney for agreeing to join me aboard the Ranger for the day. Even though we got more than wet from the rain, we both enjoyed the stable ride the 620 Fisherman provided – not to mention the more than ample power of the 250 HO Evinrude E-Tec. I’d also like to acknowledge all the Renegade pros, shoreline volunteers and event organizers for putting on another incredible event. And, it goes without saying, having Big Jim on Stage as the MC is certainly an event highlight.